and a short stroll from the center of lively Netanya. The Mizpe Yam Hotel is an intimate boutique hotel, which has a special atmosphere, due to its special architectural design. All guests feel very much at home in this unique hotel. 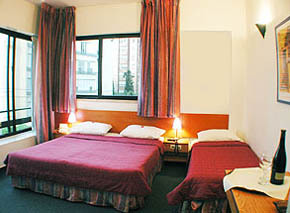 .The hotel is built to meet the requirements of tourists and businessmen alike.The guests of the hotel are hosted in a unique atmosphere in which the staff of the hotel knows each guest personally. 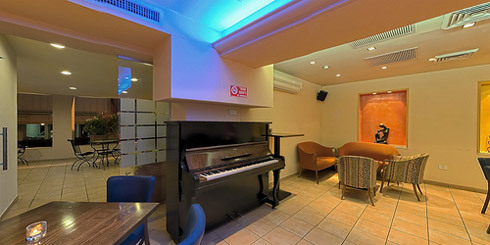 The hotel lobby has intimate corners for conversation; light meals, beverages and cocktails are served at The David Bar. Designed in a modern style, suitable for special occasions such as: Bar Mitzvahs, Brits, Weddings, Shabbat Chatan, Birthdays and every occasion that you would like to celebrate. Maximum occupancy is 170 people.Kashrut supervision provided by Netanya Rabbinate. 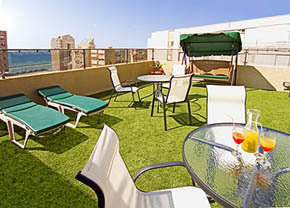 The sun roof, situated on the fifth floor, provides a sea view and a wonderful atmosphere for relaxation and sunbathing. Situated in the front of the hotel, decorated with lots of plants, where you can drink the first cup of coffee in the early morning. 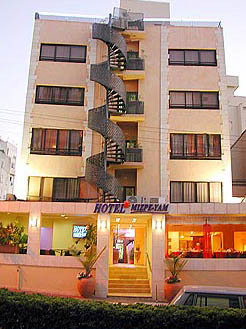 The “Mizpe Yam” boutique hotel offers 35 guestrooms, all recently refurbished.